Well a bit late again, but never mind! Here is my (Chris's) Portugal O-ing blog update. After another busy week at work, drinking lots of yummy expresso's, I was off to Portugal for some orienteering training and competitions. This was my first orienteering of the season, so I was a bit unsure how I would go, but excited to do some competitions, escape the snow and hopefully enjoy some warm delicious weather. For the first 4 days I was based out on the coast about 2-3 hours north of Lisbon running the Portugal O Meeting races. These included one world ranking event (WRE) which is acting as a selection race for WOC this year. Alistair landels and Juliette were also entered for these races, so I got in touch and managed to end up staying with them, their young baby Adam and some of Juliette's French clubmates. Two weekends ago I was left all alone in Trondheim, after Emily departed for a few weeks holiday back to NZ. Fortunately there have been many fun activities to entertain myself with, such as some more skiing and orienteering. 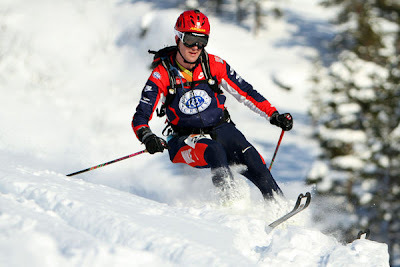 Having just bought myself some new ski-touring/randonee racing ski's I was excited to hear there was another race happening some hours drive from Trondheim. So on Friday afternoon I set off towards Høyanger with Bård and some of his friends. Høyanger, a small village beside Sogndal fjord, turned out to be a 9 hour drive away. However, other than getting a rather sore bum, this was not too bad. Høyanger ski area. You can even see the little red hut we stayed in.